Welcome to another edition of my quirky Q&A series, the Christopher Guest post. 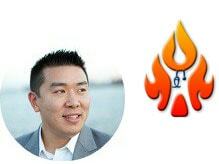 Sitting down with me today is none other than long-time blogger Jim Wang, who is now sharing his financial tips and tricks on the site Wallet Hacks. His current site only predates this one by about four months, but prior to that, Jim had a very popular site that, according to rumor, sold for millions of dollars. That site doesn’t exist anymore, so he’s been busy building up another big winner. He also had a day job that had something to do with missile defense or rocket wars or something really cool like that. The fact that he gave that up to be a blogger shows you just how cool blogging can be. Jim also keeps busy on the homefront; he and his wife just welcomed a baby girl into this world, joining an older brother and sister. Yes, they are now outnumbered. Jim is a brave man. Braver than me. I had the chance to meet Jim at FinCon17, and I see both of our smiling faces on the speakers list for FinCon18 — one more reason to look forward to the event this fall. I like Jim’s ways of looking at money and figuring out how to earn more and keep more. Read on and I’m sure you’ll learn something from Jim’s hacks. What’s a Christopher Guest post? Inspired by Nigel Tufnel, the character portrayed by Christopher Guest in Spinal Tap, I took Mr. 1500’s ten questions, and amped them up to eleven. If you’re not familiar with the scene, take 50 seconds to watch this video and enjoy the dialog between Nigel and Rob Reiner. I decided I’d start a Q&A of my own. Not satisfied with just ten questions, “this one goes to eleven”. Just like Nigel’s amplifiers. I also enjoy responding to the answers provided by the interviewee, which makes the interview flow more like a conversation. And conversation is what we’re after. What do you do (or did you do) for a living? What do you like best about your job? If you were a physician, what type of a physician do you think you would be? Why? I was a software engineer in the defense industry. For a while, I was writing code that went into radar systems for various aircraft in the military. It was a really fun job because the work was challenging like a puzzle (these were OLD systems), the people I worked with were top notch, and our testing platforms were actual radar systems scanning flights in and out of BWI Airport. It was fun seeing the planes on our little radar screens. It’s funny how the little things are what stand out. [PoF: Our jobs aren’t as different as you might think. Instead of watching and listening to blips on a radar screen, I’m watching and listening to blips of the heart. Totally blips of the heart. do you see the man in the flames yet? Describe your blog and tell us why your blog would appeal to a physician seeking FIRE in eleven sentences. Wallet Hacks is a journal where I share my approach to managing my money and enjoying the most out of my life. I find that many of life’s lessons and secrets are just obfuscated behind jargon, arcane processes, and other bull$4!t-like projections and putting up fronts for others. Money is no different. We have financial advisors that don’t know what they’re doing and financial advisors who do but aren’t able to explain it in plain English. We add to that our own confusion and worry for the future to make this magical witches brew of fear. All this to say that I hope to demystify all the crap and just talk plainly about the things I do that work. I find physicians are probably able to sort through the confusing noise from the real meat if you have enough time but why? After a long, draining day, the last thing you need or want to do is fight through words to get to the meaning. I have no skin in the game when it comes to financial advice. I’m just a retired software engineer. 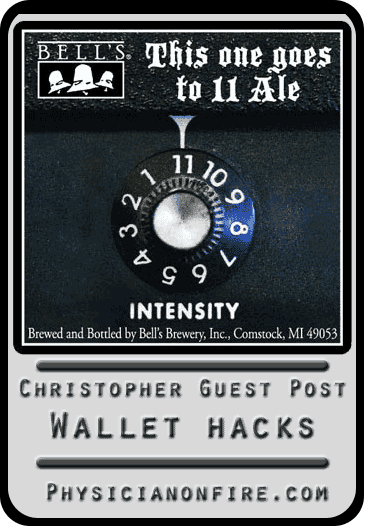 Read Wallet Hacks if you want to know what I’m doing, whether it works or not, and hopefully have a little fun in the process. [PoF: Yeah, I think that’s what most busy people want — a simple explanation of what ought to be done when it comes to dollars and cents. I know I’ve got a devoted readership that likes to get into the thick weeds on some of the more esoteric stuff and optimize everything possible (and that describes me, too), but most people just want a basic understanding and enough knowledge not to screw things up. What inspired you to start a blog of your own? Was there a particular event you remember that made you feel your blog had arrived? Any big plans for your blog in the future? Wallet Hacks is actually my second money blog. I started it because I missed blogging! My first one, Bargaineering, started in 2004 and I treated it like a journal. I thought it’d be fun to write things down so I could remember it better and a blog was just that – a journal. As the days and months progressed, it gained in popularity and readership. About six months into it, I was featured in the New York Times, which made my parents thrilled about my fun little side project. I didn’t feel like I arrived until a few years later when the blog started earning as much as I did working full-time. I didn’t have the courage, or the plan, to quit until several years later, but that was a tipping point in my mind. [PoF: I think it’s so cool that this is an encore for you. I’m only two and a half years into this venture and I already think about how I would do certain things differently if starting from scratch. Give me eleven posts you think Physician on FIRE readers might want to read. Building a Rock-Solid Financial Foundation – The basics of every financial system are the accounts you need and none you don’t. This post explains what I consider the minimum for a solid financial foundation. Drawing Your Financial Map – How to draw a simple map connecting all of your accounts so you don’t need to look it up or remember it. Build Your Financial Fortress – Comparing the pieces of a financial foundation to a castle, from the moat to walls to the tower. How We Track Our Net Worth – Your net worth is like your weight, not the last work on your health but something you should monitor all the same. How to Calculate Your True Liquid Net Worth – There’s your net worth and then there’s how much cash you can get your hands on in a short time frame – this is the latter. Do You Have a Money Field Manual? – If/when you die, your financial life is a series of numbers. Create a money field manual to explain what the numbers mean so your loved ones won’t spend eons figuring your crap out. Best Microsoft Excel Budgeting Spreadsheets – Free Household Budgeting Templates You Can Use! – There are so many tools out there that you can pay for but a spreadsheet is what I use (with some supplemental help from tools) and here are a few to get your started too. How to invest in yourself – When you have money, you should invest it in something valuable. You are valuable so look to yourself first – here’s how to invest intelligently in yourself. How to Invest Your First $1,000 – If you want to invest in the market, here’s a guide to how it all works in plain English. Is Crowdfunding Real Estate Investing Worth It? – I’ve recently started dabbling in real estate but after being burned in direct real estate deals, I’ve turned to crowdfunding real estate. 23 Proven Ways To Make Passive Income Now – If you want to work forever, you can. If you want to earn some passive income, here are 23 ideas you can consider. [PoF: Crap, now I have to come up with a financial map, fortress, foundation, and field manual? Is there a free household template I can use to come up with all that? Isn’t my investor policy statement good enough for you?!? PoF readers: 1% bonus on debt & preferred equity investment with EquityMultiple..
At what age are you most likely to retire (or at what age did you retire) from full-time work? What are you doing to help realize your retirement target? I quit my full-time job when I was 28, exited my previous blog at 30, and I consider myself retired every since then. I “de-risked my future,” as one friend put it, when I was able to exit the previous blog so now I’m just enjoying building the new site and working on all these projects for fun (and profit, though fun is a bigger priority). [PoF: I hate you. That’s really neat. Just… splendid. So when I was wrapping up residency and six years of long hours, overnight call, being “pimped” constantly and had a net worth approaching zero, you were a retired millionaire? That’s super keen. What does an ideal retirement look like for you? What will you do with your time when full-time work is in your rearview mirror? I really enjoy learning new things because of how quickly you can get better at something in the early stages. I started playing chess a few months ago and already my skill has improved dramatically. There’s so much to learn whenever you start something new that it’s addictive. Eventually, you get to a point when incremental gains become much harder and that’s when I just leave that skill on maintenance. Earn easy 1099 income with quick surveys for healthcare professionals with InCrowd. Register via my link for a chance to win an Apple Watch (Series 3) given away at the end of April to one of my readers! I started playing golf a few years back, before kids, and got to be around a slightly better than bogey golfer. When I got to that level of skill, which is not at all skillful, you shave off shots by getting better at your short game and putting. Short game and putting are all about practice and practice and practice. I didn’t have the desire to spend my time on that and am happy playing golf with my friends and scoring in the high 80s and low 90s. There are a few other skills out there I’ve always wanted to learn and I’ll get to them eventually. [PoF: It’s funny how you mention golfing because it’s almost standard issue in the FIRE community to say we’re not retiring to just play golf! Or chess for that matter. How’s your shuffleboard game? As a former golfer, I will say that better than bogey golf is quite a skill, and I was thrilled when I (very rarely) scored in the high 80s and low 90s. I’ll give you eleven sentences to dish out advice to a young physician. Any and all advice is welcome. We talk about personal finance, so money is fair game, but if you have advice on being a better doctor, a better parent / spouse / friend / human, we’re all ears. I’m not a physician and I don’t know what it’s like to be one, but I imagine it to be a high pressure, stressful career so my words are with that type of career in mind. Take care of yourself. All the money in the world and all the free time in the world is useless if your body is in bad shape. It’s an irreplaceable vessel, for now, in this world so treat it that way. Take care of your relationships. When people are on their deathbeds, they aren’t talking about how many hours they worked, how many procedures they performed, or how much money they amassed. They talk about relationships, the strength of those relationships, and what they meant to them. [PoF: “I should have worked harder and longer and spent less time with my children when they were growing up.” Yeah, that’s probably not what people say on their deathbed often, is it? You’ve got eleven days to visit anyplace in the world with an $11,000 budget. Where do you go and what do you do? We’d just visit our family. My grandfather is still around and so it’d be nice for him to see the kids. We went a few years ago when we only had our son and it was a treat for him. We’d like to do it now that we have two kiddos. [PoF: Respect for visiting family. I no longer have the option of visiting grandparents in this world, but my parents are 30 minutes away and we see them often. Name eleven beverages you enjoy. You can be as general or specific as you like. Fizzy water – just carbonated tap water with a couple ice cubes and a lime or lemon. Beer – A stout in the winter, a wheat almost every other time, an IPA sometimes if I’m in the mood but I prefer the west coast IPAs. Sometimes a sour if I’m in the mood. Maybe this answer is just a proxy for saying I’m a moody beer drinker. [PoF: Well, I mostly drink water with the little squirt bottles of flavoring added. So, Kool-Aid, pretty much. Grape and orange are my favorites. So I have the palate of a 12-year old most of the day. Three treasures rice (san bao fan) – It’s white rice topped with two types of roasted pork and a fried egg, maybe a vegetable. Soup dumplings (Xiao long tang bao) and really dumplings of any kind. Beef noodle soup – classic Taiwanese dish where everyone has their favorite style and home recipe. Wood fired pizza, thin crust but you have to eat it in like a minute or the crust gets soggy. Drunken noodle (Pad Kee mao) – the sweetness of the Thai basil plus the veggies and noodles are yum. Pork and basil stir fry (Pad Kra Pao) – spicy as all get out but the thai basil sweetness brings you back in so you burn your face off even more. Braised oxtails – can be braised in red wine, Asian inspired soy sauce, or Jamaican style; you can use short ribs too. Biryani – chicken and lamb but it’s a nice quick bowl of goodness. Shrimp cocktail – I could eat shrimp all day. Extra horseradishy cocktail sauce too for some kick if you’re making it yourself. How did you first learn about PhysicianonFIRE.com? What one piece of advice do you have for me? I don’t remember how I discovered PhysicianonFIRE.com. I’m not tapped into the FIRE blogging world (one of the reasons why I wrote that “Best of” post was to learn more about them) outside of Mr. Money Mustache, Early Retirement Extreme, MadFIentist, and a few others. I think I only read posts from time to time until we met at Fincon, then I realized I needed to carve out time to read more. [PoF: That’s great advice, my friend, and I appreciate you taking the time to share your story and your wisdom with us. It makes sense that you wouldn’t follow the FIRE blogs too closely. It’s not like you have a lot to learn from them when you’ve already been FIREd for a number of years yourself. Have a great summer, enjoy some quality time with your newborn baby and the other two little ones, and I’ll see you in September! I think as a physician we need to heal thyself first. How many of us recommend a diet or stop smoking/drinking to patients but are bad practitioners of that ourselves? We can always make excuses why we maintain bad habits (eat fast food because we don’t have enough time as busy physicians, don’t have time for exercise, etc). My father was a physician (internist) and picked up an awful habit during medical school when he started smoking. He ended up dying at age 50 (I was 14) of pancreatic cancer, likely related. One of the best returns in investment is taking care of your body from an early age. You can dramatically reduce your medical expenses in retirement by doing so. One of the biggest challenges, especially in a high stress and long hour environment, is self care. It’s so easy to let those things go by the wayside when you’re tired and your brain is unable to maintain that discipline that got you where you are. When you’re tired and your body mistakes the need for sleep with the need for food, it’s easy to reach for a bag of chips because 1) they’re delicious and 2) regular food places are closed. We just had our 3rd child, it’s day 6, and being tired all the time I can see myself easily making bad decisions because my brain doesn’t have the energy to maintain discipline. Fortunately, I know what’s going on and can force myself, in limited situations, to go to the gym, eat as best as I can, and power through. That was a great interview. I was not aware of your first blog. Congrats on your wicked success as a blogger. Your advice can apply to anyone who is working on reaching financial independence. Bawahahaha his humor!! You’re in an admirable place Jim. If I could be half you when I get to 30 I’ll do a jig right now. Your 11 foods list = 👌 I only discovered Taiwanese beef noodle soup last year. Seriously how’s noodles and cubes of beef so good? Now I get it in every restaurant that serves it. I have a strategy for food at restaurants and you can tell me if I’m crazy. If there’s a dish I like at a place I frequent, I NEVER order it somewhere else. It is a lose-lose. Either the new place does it better, then I lose a favorite at the old place… or it doesn’t do it better. Then I ordered something that isn’t as good as somewhere else. I’ve always meant to make some sort of graphic of a budget on a stick but nothing has ever come to mind. Probably should hit up someone on fiverr. Only us Minnesotans get the whole “on a stick” thing I guess? And spoonbridge and cherry… an olive? Really? LOL..
Jim doesn’t know it but he just blew my food mind. That is an excellent strategy. It also explains why my other beef noodle soups were a disappointment to my first ever noodle soup place near my house. They weren’t bad but they just weren’t good. I should have just gone to my first place. BoaS is like obsessed with Minnesota. Are corndogs naturally popular or? I needed to hear that! I’ve loved blogging, but it’s been a lot of work. I am occasionally really encouraged and then it is back to the grind. As a blogger who writes about wellness (in addition to wealth), thank you for pointing out all of the other areas of life that we should not ignore (family, health, happiness). In the Physician world, and I am sure many others, these things often get left behind. Blogging is like a lot of other pursuits in that you tend to his plateaus and have to change things up to make progress. There are so many aspects of blogging that you can shift your focus periodically to different aspects of the broader business (writing, editing, marketing, social media, monetization, etc.) and make progress is other parts when you reach a plateau. That and celebrate little victories. Those fuel you more than anything else. Getting a link from another blog, mentions on mainstream media or aggregators like Rockstar Finance, advertising deals, or even just the potential of a deal – anything to keep you going. Thanks, Jim. That’s exactly what I am doing! Slow and steady wins the race. You have excellent taste in beer Mr Wang! “…the longer you do it, the better you become…” That’s great to hear. As someone who just started a blog without having any idea what he was getting into, I’m sometimes a little overwhelmed by how much there is too learn. Enjoyed the interview very much, and congratulations on baby number three. We have four, and the jump from 2 to 3 was definitely the hardest! You go from being able to play man to man, to having to play zone. Its lots of fun, but there is an adjustment period. My grandfather used to make the best oxtail stew with a tomato-y/ketchup-y asian-inspired sauce! The meat just slips off the bone and into your mouth! Very mouth-watering. And soup dumplings? Like Din Tai Fung here in California? Btw, I love your site. All 11 articles that you mention are classics. And the article on the Southwest Companion pass that you had written a while ago was very helpful for me too. I love stews… so rich and rewarding. Oxtail is nice (though gotten so much pricier lately) and that rescipe sounds great. Soup dumplings = xiao long bao, just like at Din Tai Fung though I’ve never been. Thanks for the kind words, I’m glad you enjoyed those articles! Jim I didn’t even realize when I met you that you had a seven figure blogger past. Dig the humility. Are you allowed to share why they closed down the site after buying it? Do you regret selling at all or was it the best decision you’ve made? And @PoF tell your kids to bring the chess sets I’ll take em on. In present day – i’m glad you’re writing again at WalletHacks – in some ways the site is even better than before. Keep up the great work – and try to get some sleep! We have a 2 month old right now so I can relate on the lack of sleep. Outstanding CG interview, Jim! And great commentary as usual, Dr. POF! It was great to know more about Jim in this post, though we’ve been in touch for a while through mails. Jim, I greatly enjoy your blog, though I don’t comment much – there are many blogs I am a silent reader of. The way you simplify matters is impressive – you are wise beyond your years, “young man” (as someone a decade older than you, I think I can say that). Keep up the good work! Take care of your relationships. When people are on their deathbeds, they aren’t talking about how many hours they worked, how many procedures they performed, or how much money they amassed. Wise words indeed Jim! Or as I like to say it “No one ever said ‘I wish I spent more time at work’ on their deathbed”! I agree with everything you just said. In the illustrious words of Patrick Swayze, “ditto.” Time flies. I try to make sure I take care of my relationships and just stop and smell the roses every once in awhile. I too started reading more blogs after going to FinCon18. I wanted to see what people were talking about. Glad I took the time. It has been very informative and nice to get to know other bloggers. Loved this CG interview, and really enjoyed being introduced to Wallet Hacks. Thanks, PoF. Jim, congrats on mastering a new skill. Right now my kids are into learning chess, Chinese, and knitting, none of which I knew anything about a few months ago. I’m watching a lot of YouTube videos that begin with “The Absolute Idiot’s Guide to…”. The kids have been great at forcing me to learn new skills and horizons, whether I to or not. And congrats on baby number 3! We love our big (4 kid) family. Chess has been a lot of fun rediscovering. I played it enough as a kid so I knew the basics but it was never a serious player, I never understood the game to the degree I understand it now (just six months into playing it again). It looks so simple but it has an elegant complexity to make every game fascinating to study (and play! ).